Plenty continues to happen on the Tribune Company breakup story. In a far reaching article, the LA Times tells us that not many people want to buy the Tribune. And those that do, don't want to pay a lot. Investment firms appeared to have only lukewarm interest in buying Tribune Co. in its entirety as of a Friday deadline for initial offers, increasing the chances that the media company would be broken up and sold as pieces. But the real news for Cubs fans comes from this section of the article. The muted response could mean a sale at little premium or it could force the special committee of directors reviewing offers to conduct a second round, this time soliciting bids for Tribune's 11 daily newspapers, 25 television stations and other holdings, which include the Chicago Cubs baseball team and stakes in the online job-search service CareerBuilder and television's Food Network. Investment experts observing the deal doubted that an outside buyer would keep Tribune intact. "No one will buy this and keep it whole," said one executive at a private equity firm that is among the bidders. "They'll do the dirty work of selling off the pieces that the board doesn't want to do." The "dirty work" means things like the Cubs. If Tribune Company CEO Denis FitzSimons doesn't want to sell the Food Network, CareerBuilder and the Cubs, then some raider will buy the Trib stock in the low 30’s (and take out the Chandlers at a small premium), and then sell the pieces to try to realize the $42 to $46 valuation that some believe the Trib has locked in its balance sheet. This has truly been a fascinating story with case studies to be created on finance, public relations, and shareholder relations. It's like following a player from the minors up to the majors. You first get wind that there's something interesting happening. You follow the news to see how things progress. Along the way there are happenings that give you signs of future direction. With a Felix Pie it's a 2 homer game. With the Trib, it's a downgrade of their debt rating and a shareholder revolt. There's always been activity around this story and not it seems to be coming to a conclusion. Too bad. It's been more entertaining, and actually more active and fluid, than the Cubs have been since 2004. The Bears only made one mistake today. On their first drive on 3rd and 3 from the 25, Offensive Coordinator Ron Turner called a pass. Thomas Jones already had three rushes for 9, 9, and 7 yards on the drive. Give him the ball again. What is written above was taken from the Webster's Dictionary web site under the heading "nitpick." Watching today, seeing the turnovers, dominating defense, a short passing game, and a running back that ran for huge tracts of land and caught a few passes as well, and this team looked a lot like a team from 21 years ago. What the Bears have done with last year's stinker playoff loss and this year's perfect start is make anything less than Superbowl appearance a severe disappointment. But there's a golden opportunity here that we all should be hoping for. As most of the national media has noticed, there is another team at 7-0. That would be the perennial team with a chicken bone in their throat, the Indianapolis Colts. With the Superbowl in Miami this year, we football fans should be united in this wish: That both these teams reach Miami undefeated. What could possibly be a better tasting side dish to a title than seeing the sulking faces of the increasingly creepy 1972 Dolphins see their undefeated season become an afterthought? In Miami, no less. Can you imagine the look on the faces of Nick Buonticonti, Larry Csonka, and Paul Warfield as they walked out to the 50-yard line for the coin toss? Oh, for the sauce on the goose to be Brian Griese throwing the winning touchdown pass. I sat next to him once. 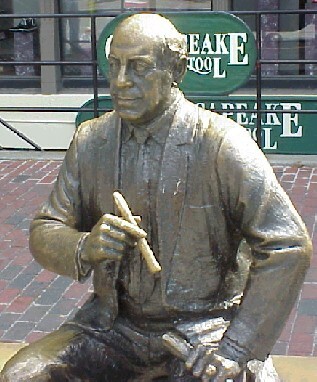 This statue in Quincy Market, that is. As close as I ever got. Over at Goatriders, "Pestilence" Byron pens a piece on a possible suitor for the Tribune. It's a good article and correctly describes how private equity firms operate. What the piece fails to do is truly connect the dots between Blackstone Group and the Trib other than to note that Blackstone is seeking more cash for its fund. Byron's logic seems to be: Blackstone seeking cash + Trib price means Blackstone needs more cash + Trib in play = Blackstone possible suitor for Trib. Now, that's certainly possible. Blackstone has made multiple investments in the media arena including Aldelphia and Bresnan Communications. It also possible that Blackstone has something completely different in mind. In fact, given the number of companies that could possibly be bought, it's more likely they are interested in another company. John Madigan, the former Tribune Co. chairman and chief executive who went on to become a special partner at Madison Dearborn Partners LLC, is taking a leave of absence from the Chicago-based private-equity firm, Chief Executive John Canning confirmed Tuesday. Madison Dearborn is among the numerous buyout firms weighing whether to make a bid for the Chicago-based media company, which might put all or parts of itself up for sale. Tribune owns the Chicago Tribune, the Los Angeles Times, WGN-TV, various other media properties and the Chicago Cubs. Madigan is stepping aside to avoid any appearance that he could be involved in any talks until Tribune's future ownership structure is sorted out. Now, THAT's a sign of a potential buyer. To be clear, we're not bashing Byron here. It's just that there's no clear connection between Blackstone's actions and the Trib. Not so for Madison Dearborn. WSCR's Mike Murphy dropped out a rumor today that was directed this way last Friday from The Source. The rumor makes a case for the reason "Interim" is still tacked onto John McDonough's presidential title. It seems that the Trib may have another candidate in mind for that job, but they can't make him an offer yet. Who is this mystery man? Now, this page has no problem with bringing Mr. Dombrowski over. In fact, such a move should be highly encourages and would be swiftly endorsed by all clear headed Cub fans. On one condition. Check Dombrowski's current title: President/CEO/General Manager of the Detroit Tigers. That's the title he should have were he to come here. ALL those titles. Don't set this guy up as McPhail and make him work with Jim Hendry or any other GM. Make DOMBROWSKI be the GM. Now, as to handicapping this rumor, color me doubtfull. It makes very little sense for a company in the Trib's position to go out and get a guy to restart the organization like a Dombrowski would. It makes more sense to setup a caretaker structure for 2007 and see who might own the team in 2008. There is a way that this DOES make sense. More on that tomorrow. So far, three contenders have emerged: one group consisting of Madison Dearborn Partners, Providence Equity Partners, and Apollo Management; a second group consisting of Thomas H. Lee Partners and Texas Pacific Group; and Carlyle Group. It is unclear whether the latter will bid alone or join a consortium of buyers. The Wall Street Journal said the Chandler family, which is Tribune's largest shareholder, would accept an offer in the mid-$30s per share. The stock closed Friday at $32.31. Tribune hopes to close a deal by the end of the year, the newspaper reported. There are 69 days left in the year. If they plan to close before year end, expect announcements sooner rather than later. Closing takes tons of legal and financial work. To get that done by year end means that the bidding must nearly be over. An astute reader just e-mailed me this. It seems that the website domain "www.firejoegirardi.com" was purchased on October 4, 2006. Someone was planning ahead. Wanna know where it points? Click here and have a good laugh. Sure seems like some one didn't want Joe having to face any criticism. So as to serve equal time, Fireloupiniella.com is also taken, but not redirected. The link is now to a parked GoDaddy.com page. Sorry if you missed out on the hilarity. Never been to a pro-baseball game. Or even a Cub game. While a warm Ivy Chat welcome is extended to Lou Piniella, a few words must be aimed at the detractors of his hiring and a question must be lobbed (grenade style) and Jim Hendry. All of Lou's detractors seem to be making the same arguments against him. These arguments can be summarized by saying Lou is just Dusty but with an anger management problem. Let’s stipulate that Piniella is a more fiery type than Dusty Baker is. We might also concede, reluctantly, that Lou is not as interested in things like OBP that some of the more modern baseball minds embrace. And the return of Larry Rothschild isn't something very favorable, either. In the minds of some, these properly enumerated points sum up to the conclusion that Lou is Dusty. Just because a guy has some similar attributes doesn't make him a clone of everyone that also shares those few attributes. Dusty Baker was, to be polite, lax on fundamentals. He was lax on hustle (well, hustle at all times). He was lax on accountability. Lou Piniella's history suggests he is the opposite of Dusty Baker in all these areas. When you consider that, ultimately, the success or failure of the Cubs is going to be on Jim Hendry for the quality of player he manages to obtain, you begin to see that the rants against Lou Piniella are really just the whining of those who really wanted the cuddly Care-Bear hiring of Joe Girardi. Given these huge differences in approach, the arguments comparing Lou to Dusty are threadbare. Lou Piniella has some qualities similar to Baker. Guess what? Joe Girardi shares some qualities with Baker as well (aside: as it looks more and more like Girardi won't be getting a managing job anywhere, doesn’t that suggest there’s a good reason why?). The chance of Lou being as poor a manager as Dusty Baker is quite remote. And a huge question to Jim Hendry. Let's see if we have this correct. At the All Star Break, the Cubs were 34-54. Dusty Baker was going to be evaluated. Dusty was then retained for the rest of the year, but fired one day after the season ended. If the decision to fire Baker was made before the end of the season, why wasn’t Dusty fired earlier and Lou Piniella hired right around the All Star Break? The Cubs were clearly already interested in Piniella. Lou was available and being touted for Dusty’s job in a media-based trial balloon around that time. Had they hired Lou in July, the rest of the year could have been used to give Lou some time to evaluate his players. He could have set a tone for 2007. And, given the crapfest that was the National League, if Lou is so good, perhaps the Cubs could even have made a run at the Wild Card. Instead, we fans were treated to a waste of our time and dollars. Jim Hendry. Why oh why is this man still in his job? When you see the replay of tonight's unbelievable Bear win over the Cardinals, watch Devin Hester's punt return. And watch for #94 to throw not one, but two key blocks. Sure, Hester deserves at ton of the credit. And Brian Urlacher, who has not always lived up to his reputation, played at Hall of Fame level tonight while stealing a ball from Edgerrin James and a page in Bear history from Steve McMichael. But those of you who know how to watch blocking, will appreciate what #94 did tonight. In your scorecard, #94 is Brendon Ayanbadejo. Now, this page would have slightly more love for Brendon if he spelled his name with an "A". But, tonight, this page saw what you did. And you almost single handedly won the game for the Bears. They worked in Toronto. They worked in Detroit. They've worked in many cities. The White Sox failed to repeat as world champs this season, but they did beat the Cubs in local TV ratings for the first time in at least two decades. Chasing a wild card bid into September, the Sox ended the season this month with higher ratings on broadcast stations WGN-TV/Channel 9 and WCIU-TV/Channel 26 and on cable's Comcast SportsNet. The Cubs, with the worst National League record, lost viewers. The three stations accounted for most of the games televised in the region for both teams. This, plus empty seats, is the main reason why the Cubs made changes this year. The Tribune Company realized that one of their brands was hemoraging customers. Congrats to all the fans who refused to go and refused to watch. You are heroes. You got Andy MacPhail fired. You are responsible for the change and don't let anyone try to tell you differently. All Cub fans interested in a winning franchise owe you all a debt of gratitude. Peole like me who actually went to a game with your kids, we're the suckers (although not as big of suckers as those who actually paid for their tickets). Also, if you are looking for a reason the Trib may just sell the Cubs, despite the tax hit they would take, this could hint at it. Perhaps the enterprise value of the team has peaked. Delaying a sale could cost even more than the tax hit, a cost a highly leveraged, growth challenged company may not be able to afford. According to The Source, Lou Piniella will be named manager of the Chicago Cubs within the next few days. The Source got that directly from Jim Hendry. While contract terms have not yet been finalized (meaning total dollars and total years), there seem to be no major impediments to arriving at mutually agreeable terms. Call this site satisfied. Piniella would not have been this site's choice, but he was from the list of names given by the major media sources. As this site has said, this is clearly the best choice for a team that wants to compete in 2007. If the fans could be certain that the 2007 Cubs would unload everyone with significant salaries in exchange for nearly ready talent, Piniella is not the guy you want. While such a strategy would be the preferred strategy, Jim Hendry has never shown both a willingness to do a complete "dump and reload" nor the scouting skills to make such a strategy a success. Given that, hiring Piniella and dropping $50 million on free agents is the only way this team can compete. For those of you upset with the passing over of Joe Girardi, let me explain this: There was no way that Jim Hendry was going to hire a guy with mixed credibility like Joe has. Jim has 8 months left to have a team 10 games over .500 or he's going to be rooming with Ed Lynch. Hendry had no choice but to take a known quantity. If you are upset at anything, direct your ire at Denis FitzSimons and John McDonough. By failing to clean house entirely and fire Jim Hendry, they forced Jim to act with a sense of what is good for the short term and risk the long term. This is what I was talking about when I said the Cubs should avoid allowing Jim Hendry to pick a new manager without having his contract extended beyond 2008. Without the contract extension, Jim is thinking about saving his hide first. And that led to the selection of Lou Piniella as the next manager of the Chicago Cubs. While the Cubs managerial search is effectively meaningless compared to the acquisition of players this offseason, there are a lot of developments in this area. The biggest piece of news is that Bruce Bochy is going to be available for Jim Hendry to interview. For several reasons, Bruce seems to be Jim’s first choice. Some of it has to do with Bruce’s success in winning four division titles and one National League pennant in his time in San Diego. Some of it also has to do with not getting a person here who would require a contract longer than Hendry’s. It’s also obvious why Hendry is interested in Lou Piniella. Lou would bring, in Hendry’s eyes, instant credibility for a fast turnaround. At 63 years old, Lou wouldn’t be here much more than 2 years. Lou wouldn’t come here for a long term build. Lou would come because Hendry would try to acquire three or four big names in a hurry. If Lou wasn’t convinced of this, he’d pass on the job. Given that Hendry has, at most, two years to fix this heap of crap of his own design, Piniella would work within that same time horizon. What’s become clear is that Joe Girardi is clearly NOT who Hendry wants. And Girardi knows it, yet wants the job. Badly. Girardi's open lobbying in the press and every radio show last week was all about currying favor with the fans and the media and trying to place political pressure on Hendry to give Girardi the job. Bad move. If there’s one thing that Hendry hates it’s the media trying to force his hand. Word has it that Hendry was pissed that Mike Murphy asked him on WSCR why Hendry only talks about improving the team and never uses the words “World Series” like McDonough did. How would a personality like that respond to Girardi’s open lobbying through the media? Badly is my guess. Ironically, I’m not too surprised that Hendry doesn’t want Girardi. Yes, Joe did a good job last year. But Joe also failed to get along with the Marlins management. Jim Hendry gets along very well with Marlins management as Derrek Lee and Juan Pierre’s presence on the team will attest. You can be sure that Hendry was very wary of Joe before their meeting. It wouldn’t surprise me if Hendry didn’t even want to interview Girardi, but felt compelled to Jon McDonough and the lemming fans who only want a feel good story. Lou Piniella certainly seems to be the best choice of the current crop, if only because it increases the chances that offseason moves would include multiple difference makers and not just a new marketing toy. And he could quickly become the disgruntled fan’s voice, openly bitching at ownership if they weren’t fully forthcoming and financially supportive. From a pure baseball point of view, this page is ambivalent about the actual quality of the managerial skills of Bochy and Piniella, and most hesitant about Girardi. But anyone who wants to see wining baseball in 2007 better hope for Piniella. The hiring of Joe Girardi would all but signal that 2008 would be the next year worth watching. Have you heard? Alex Rodriguez is on the outs in New York City. Yes, the rumors are the Yankees don't like him anymore because he can't hit and can't field in October. Since the Yanks are now considering trading him, and the Cubs desperately need a shortstop, the Cubs should go get him. Right? I don't think so. And not for the reason you'd think. I still say one of the worst days in Cubs history, in terms of winning, was May 6, 1998. On that date, Kerry Wood struck out twenty batters. After that, John McDonough had the tandem of Sammy Sosa and Kerry Wood as the new Telecubbies that would draw adoring sycophants to see them play. Regardless of the quality of the rest of the team. As we all know, for the last 12 years or so, marketing and the related profts have driven the Cubs. And to keep those profits rolling, we were all fed heavy doses of Sammy and Kerry. With Sammy, Barry Rozner always reported that internal Cub management kept him happy by allowing him to do whatever he wanted (unless Joe Girardi was around). Why would they do that? Beacause McDonough knew a happy Sammy was a more marketable Sammy. We ate it up. And the Cubs lost more than they won. Today, the rumors are that A Rod could be a Cub. Great. Another marketing piece for McDonough to throw at us and try to placate us with individual exploits and, oh yeah. Wins if they get lucky. Now, there is a case where I'm happy to see A Rod here. That case includes Barry Zito, Daisuke Matsuzaka, and Alfonso Soriano. But if it's A Rod and hope for Mark Prior to return, no thanks. Quite a list of managerial candidates that Jim Hendry has seemingly compiled. One has to ask, why is it taking him so long to make up his mind on who to hire? It's clearly not a matter of due diligence. See, Jim told us fans back in July that he was going to evalute the departed Dusty Baker for the rest of the season. Jim announced that Dusty would not be offered a new contract the morning after the season ended. That means that Jim Hendry is a hell of a speed evaluator. He analyzed the data and made up his mind in about 18 hours! That may not be right, tho. It could also be that Hendry made up his mind some considerable time before the end of the season. That would have given Hendry anywhere between 2 weeks to three months to start evaluating new managers. So, which is it? Is Hendry the quick draw who now can't get his gun out of his holster? Or is he the patient artist who has completed the due dligence but just can't seem to make an offer to his chosen candidate? To think that Jim Hendry, a man who is about to make one of the most important choices in his future, waited for the season to end to make all these choices is disconcerting to say the least. Think back three years to October 1, 2003. Would anyone have been willing to bet then that every sports franchise in Chicago, exlcuding the Black Hawks, would win a title before the Cubs? Anyone take that bet today stipulating the White Sox? Christian over at the Cub Reporter has posted my responses to his year end roundtable, along with those of Derek Smart and some other guy who doesn't seem to know who I am anymore. The questions and my responses are also reported here so that I don't have to go look very far to see what I wrote. 1. Dusty, Dusty, Dusty, is there any reasonable scenario that you can see him staying? And if he does go, sum up his tenure in 2 sentences or less. If the operative word is "reasonable," then, no. I see no scenario that has Dusty Baker staying in Chicago past the time his plane departs for California next week. Sentence 1: From the moment you said, "Why not us?" through the time you shouted down Tony LaRussa in that five game series in September 2003, you made me proud to have you as the Cubs manager. Sentence 2: From the time after Game 7 of the 2003 NLCS when you sat Darren Baker on your lap to shield yourself from hard questions (like, “Why didn’t you use Matt Clement instead of Dave Freaking Veres?”) through game 162 of the 2006 season, I’ve never been more embarrassed by a Cub manager in my life. 2. Assuming Dusty joins the unemployment line, what do you want out of the next Cubs manger in terms of personality and qualities. Is there an individual you have in mind? Logic and honesty are the two qualities the next Cub manager needs to have. 3. At what point did you give up your playoff aspirations for the 2006 Cubs? Well, there was December 3, 2005 when Rafael Furcal signed with the Dodgers. Then there was the signing of Jacque Jones on December 20, 2005. There was the not-injured-but-he’s-just-not-practicing of Mark Prior in February and March of 2006. There was the Kerry Wood and Wade Miller and the illogic that they would be ready in May only to have them ready for never. There was the lack of a trade for weeks after Derrek Lee broke his wrist. But, if you want to pick a day when you could tell the actual, on the field team was dead, that was May 4, 2006. The Cubs blew their game that day against the Diamondbacks with a performance more lifeless than Judy Baar Topinka. The embalmer showed up the next day at Wrigley and it was over and out for 2006. 4. There were far too many things that went wrong with the club to address in this space, was there anything that went right? Chuck: Ryan O'Malley. That’s about it. Beyond that, for a portion of the year, Scott Eyre and Bobby Howry provided the kind of bullpen that the Cubs envisioned when the season started. But from Juan Pierre being a quality leadoff man to Ronny Cedeno’s struggles to Phil Nevin orchestrating his own trade to Greg Maddux exploding in the dugout to seeing the minor leagues exposed as being devoid of real pitching prospects, it’s hard to think of a single thing that went right. Well, perhaps the lack of fan interest the last month of the season was one thing that went right. 5. Can the Cubs compete next year without signing Aramis Ramirez? Chuck: Absolutely. All they need is a replacement, a new second baseman, a new closer, and two or three starting pitchers. 6. The Cubs seem to have more questions marks than the Riddler’s costume; prioritize the Cubs off-season moves in a handy clip and save card for Hendry. Chuck: Acquire two veteran starting pitches. Acquire a new second baseman. Acquire a new right fielder. Acquire a new center fielder. Other than that, how did you enjoy the play, Mrs. Lincoln? 7. You have $13-15 million burning a hole in your budget next year and one roster spot available. Give us the 3 free agents you target with that money. Chuck: That’s not enough money. This team needs to get two or three players at that price point to contend next year. If I’m only getting one person, I’d have to go get Barry Zito. This team is devoid of reliable pitching. At least Zito is reliable. 8. What are 3 things the Cubs should avoid doing this off-season at all costs? 1) Allow Jim Hendry to pick a new manager without having his contract extended beyond 2008. 2) Sign Carlos Lee to an at or above-market value contract. 3) Panicking and making another stupid signing like Jacque Jones. Don’t ask me what that move might be, but, if it happens, everyone will know it when they see it. 9. Lightning Round: Give us your thoughts on these players and how important they should be in next year's team? Should have been traded mid-season. Love his attitude, his heart, and his reading skills (see Comcast Cable’s On Demand area). Hate that he no longer gets on base enough. He was acquired two years too late. Probably should not be back in 2007. Et tu Sammy? There’s a reason the White Sox got rid of Carlos Lee. Look how they did without him. Ramirez is a money player. That means he plays for his money. As important as a backup fungo bat. Despite deep Ivy Chat love for Matt and his kids, Matt should be candidate number one to be traded for prime pitching or outfield help. The guy can hit. He can’t field. He’s cheap. Could you use him as Carl Crawford bait? He’s going to be 27 years old. His trade value is probably lower than his value as a cheap #4 starter. Pencil him in and let him throw those Frisbees. Prime trade bait. Once again, as is the Jim Hendry theme, a year too late. I’d rather see him than Ronny Cedeno again. Send him to Arlington Park. When he snaps his fetlock in Spring 2007, he can be humanely destroyed. 10. Can the Cubs be contenders next year without expanding the budget to $150 million and what will it take to do so? Yes. They only need to expand the budget to $125 million. What does this team need to contend next year? Barry Zito, Carl Crawford, Alfonso Soriano, Akinori Otsuka, no Jacque Jones, Ryan Dempster in a setup role. They also need some cohones from Jim Hendry and money from the Trib. Given the history of the first and the financial status of the latter, I expect neither. As the Mets wrapped up Game 2 of the NLDS, I found it was hard to hate them anymore. Back in the 1980's, it was easy to hate the Mets because they played the Cubs 18 times per year and they were from New York. Today, they don't play the Cubs that often every year and they have a bunch of players that the Cubs should have had. In fact, the Mets have built this team the exact way a team with the financial resources like the Cubs should. Tom Glavine. Carlos Beltran. Cliff Floyd. Carlos Delgado. Billy Wagner. More than a few Ivy Chat Wish List-ers in that crowd. This team I was watching, there was every reason that it should have been the Cubs. Then, the phone rang. It was The Conduit to The Inside Source who Used To Live Next Door To Al. He said something rather smart. "Cubs fans need the Mets to win and the Cardinals to lose," he said. Not because we hate the Mets less than the Cards. Rather, because, if the Cards win with their back-door entry into the playoffs (is there any other way when Jim Edmonds is involved) and their lower payroll than the Mets, the Cubs will think that the Cardinals are the model to emulate. I'm afraid that's exactly correct. We need a Yankees-Mets World Series. Or, a Mets-A's World Series. The Cubs need to be shown that the two models of statistical analysis and heavy payroll both work. If it's the Cards and the Tigers or Twins, the Cubs will believe that they can win by just barely getting better than the Cards for 2007. And do it on the cheap. And that's got disaster written all over it. The events of the weekend showed, in more ways than one, just how much uncertainty there is running around 1060 West Addison and Tribune Tower. Andy MacPhail leaves, knowing he was going to leave for months but surprising (so they say) the other team execs and not setting an orderly transition. John McDonough, a 20+ year team officer, gets named "interim president." Denis FitzSimons non-deny denies that the Cubs are for sale. Dusty leaves and refuses to answer questions. And Jim Hendry gets left standing alone, trying to avoid becoming Mark Hatley (no, I don't mean Hatley-like as in dead). Well, I think it's all pretty simple, actually. I think it all has to do with the uncertainty over the Cubs actually being sold. Let's step back and look at the July meeting Andy MacPhail had with Crane Kenney. Aside: Crane is not only general counsel of the Tribune Corporation, but he's also one of three people on the Cubs' board of directors (along with MacPhail and FitzSimons). What got me curious about that meeting wasn't that it took place, but rather WHEN it took place. Why review a baseball operation in July? Why not October, after a season ends? Why not January at the end of the Trib fiscal year? There had to be something unique to trigger a July review. Looking back at what was going on in the Trib board room, the reason for the July review becomes obvious. The Trib was reviewing all its assets in advance of the September special board meeting. How do we know this? Back in May, the Trib outlined a plan to turn the company's stock around via debt, share repurchases, and small, targeted asset sales. On June 7th, the Chandler family balked at that plan and made a public statement advising "the Company that they do not share the opinions" of the Tribune on the May recapitalization plan. That means, the Trib was going to need a new plan, a plan over which FitzSimons might not have full control. Wouldn't the first, logical step in designing such a plan would be a review of ALL Trib assets? Not just the ones FitzSimons wanted to unload in the May plan? Of course it was. So, clearly MacPhail was with Kenney to review the Cubs top-down in advance of reporting to the board the status and value of one of the company's key assets in case it was decided to place the team up for sale. To finish the time line, it was at this meeting that Andy tendered his resignation. FitzSimons accepted it sometime in late July or mid-August, before the special board meeting. Now, I'm not saying that this indicates the Cubs are definitively for sale. Rather, that the OPTION of selling the Cubs is being considered by the board along with all other Trib assets. Additionally, such a decision is now one in the hands of the Trib board of directors and out of the hands of FitzSimons. Once you realize this, the reason for the rest of the moves in the Cubs front office become obvious. Since no one knows who is going to be owning the Cubs 6 months from now, why go hire all new management? Any new owner is going to want his own president, his own GM and his own manager. So, how does FitzSimons fire MacPhail but keep the team steady in case he is directed to sell the team? First, you promote from within. That leads to the elevation of McDonough. Second, you keep the GM for short term continuity's sake. You aren't going to get a GM of any caliber if he knows ownership is in flux. Ergo, Hendry stays for the time being. Now, the last piece is the manager. There are only two types of managers that will take the current opening at the Cubs. One would be a guy so desperate to manage that he'd manage a 7-Eleven if he could be on a ball field. The other is a guy who would be so strong with the media and the fans reputation wise that he would survive the standard new ownership purge. Who fits the latter description? How about the three names being bandied about: Lou Pinella, Joe Girardi and Bob Brenly. It's pretty clear that the events of the weekend confirm that the Cubs are, indeed, one of the Trib assets available for sale. The question is: Where do the Cubs rank in terms of assets for sale? Are they at the top of the list or somewhat lower? We should all find out in the next 3 months when the Trib board meets again. Uncertainty reigns. And with it, the hopes of winning baseball at Wrigley Field. May the Trib decide what to do quickly or 2008 will be soonest there could be any hope for Cub fans. Many of you know that today, on the Jewish calendar, is Yom Kippur for the year 5767 (I'll be writing 5766 on my checks for weeks). Today is the day you atone for your sins through prayer and fasting. What most people, even most Jews, do not know is that prayer can only absolve you for sins committed against God. In the Jewish tradition, there is no prayer that can absolve you for sins you have made against other people. In order to be absolved of those sins, you must ask for forgiveness directly from the people you've sinned against. Yup. No confessions and a few Hail Mary's for penance. You have to go up to the person and directly, sincerely ask for forgiveness. What even fewer people know about our tradition is that, if you ask for forgiveness, the person does not need to forgive you. However, if the sinner asks sincerely for forgiveness three times and forgiveness is still not given, the sinner is then absolved. The person who did not give their forgiveness now bears the sin. Last night, just before the start of the holiday with the Kol Nidre prayer, the Cubs have asked us fans twice for forgiveness. They asked first with the firing of Andy MacPhail. They asked second with the firing of Dusty Baker. Unfortunately, the third request would be via the firing of Jim Hendry. Until that sin is dismissed, we fans are under no obligation to forgive the Cubs. More later on why John McDonough was named "interim" GM, why Andy MacPhail was reviewed in July, and where the Cubs stand on being sold. All these issues are tied together. A couple of months ago, MacPhail and I went to lunch. It was strictly social, off the record, although he never insisted it be so. I remember asking how it worked when the Cubs wanted to make a costly acquisition or a major trade. Was the team president empowered to OK it? Or did he need a stamp of approval from someone at Tribune Tower? MacPhail said it varied. But generally, out of courtesy or necessity, he'd run it by Crane Kenney. "Who's Crane Kenney?" I wondered to myself. Turns out Kenney is a formidable figure in my workplace, a Tribune Co. senior vice president and general counsel. Yet from a baseball standpoint, he might as well be the invisible man. It's a good thing the Cubs have always been run independently from the Trib. First, some massive applause to "Pestilence" Byron for transcribing Andy MacPhail’s press conference. The full text can be found here. "Obviously, I haven't been as effective as I wanted to be. I think it's pretty thin soup for a franchise that's had a payroll generally in the top four or five or six or seven over the course of that time. We should be doing better and we're not. I'm the CEO and I'm responsible." Agreed. Nice to see the chief saying that it's his fault. "I did meet with Dennis a couple of weeks later (some time between mid-July and mid-August). It's obvious to me that the losses were wearing on Dennis. He's a very competitive guy. He wants to win. It was at that point he said, 'Hey look Andy, we've just got to try something different. It's time.'" So, this was decided at least two months ago. Hmmm..... What was going on at the Trib back in the July/August time frame? "The last couple of years, three now, at least the last two. we've had our highest priced players on the disabled list for most of the season." And your GM made delayed efforts to replace them. Injuries happen. Smart people make adjustments. Especially teams with "a payroll generally in the top four or five or six or seven" of teams in the league. And where's the mention of Mark Prior who was hurt when he was cheap? What about the key minor league pitchers who were hurt? Spare the fans the injury excuse. Oh wait, he brings it up again later. Too much of the payroll has been sitting on the the sidelines. It's nobody's fault. It's just fact. Whether it was Nomar and Kerry last year, or D-Lee this year. "over the last ten, twelve years, the Cubs have developed more pitching than any team in the big-leagues. So we've done great. With position players we've done poor. We don't have the numbers that we have [with pitching], part of that is just, you know by the fact that we emphasize pitching. More garbage. How about the objective measure of "good players"? The pitcher stats he's using include players who made the majors. This means he's including the David Aardsmas, Angel Guzmans and Jae-kuk Ryus. About the only real head he can hang his hat on is Carlos Zambrano. Kerry Wood and Mark Prior? Top 10 picks. They were no-brainers. Andy MacPhail is gone exactly because he and his farm directors have produced low yield crops of major leaguers. Let's move on to Denis FitzSimons who took a few minutes from spreading fertilizer on avocado groves to show up at Wrigley. Q: In light of Pressures on Dennis and other companies in the Tribune. Was this just something else that was one more thing that you couldn't accept the failure of this franchise and what you have invested in these last few years? DF: "You know, it's always good to see you guys. I could have done without this press conference. "This is a baseball decision. It's an issue of making sure our fans know that we are committed to winning. Andy MacPhail has been committed to winning, For whatever reasons it didn't work out, and we're at this point getting ready to work on 2007 and those baseball decisions will continually be made out here at Wrigley Field." Q: On the Tribune selling the team? DF: "We retained financial advisors last week to look at strategic alternatives. We will not be discussing the sale of any individual assets." Q: "So you are going to keep the team for the time being?" "Nice to see you guys"? My, my. Pretty testy for a newspaper man. Looks like a big non-denial denial. The Cubs are certainly an asset that the Trib is willing to part with. It may not be number one on Fitz's list, but he makes it very clear that he is no longer in control of what will and will not be sold. The Trib Board of Directors is in charge, now. "For the time being" would seem to end in December. The purpose of why I have been asked to do this job is for the Cubs to win the World Series. Not win the wild card or win the division or win the pennant, but it's time to win. It's time to win the World Series. And I think we need to reward these tens of millions of fans who have waited for a long time. If he'd said anything else, he should have been lynched (not Ed). The greatest fan experience is winning. It's not about marketing. It's not about being creative it's not about bringing people into the ball park or the seventh inning stretch or any of these other things. It's all about winning. Winning is the greatest marketing idea of all time. Well, at least he says that. Too bad more fans don't agree. Q: Have you thought about structual changes in the front office? JM: "I don't have that answer just yet. That's something that will develop over the next few weeks." Read: Jim Hendry's job is not guaranteed. There are a lot more questions as to why now? Where do the go from here? How long does McDonough have? More on that later. John McDonough as temporary President! If anyone TIVO'd the end of the Cubs game, see if you can upload the video montage to You Tube. Must. Watch. Video. And, if you can, send me a link. Comcast just ripped the Cubs to shreds. Very interesting considering that the Tribune is a part owner of the Cubs.